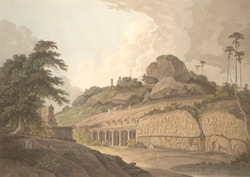 Plate 2 from the fifth set of Thomas and William Daniell's 'Oriental Scenery' called 'Antiquities of India.' This small excavated temple has a double range of columns typical of the Pallava dynasty of the 7-8th century, with a seated lion supporting the lower part of the shaft and the capital crowned by a group of three men on horseback supporting the cornice. The large relief sculpture on the adjacent rock surface beside the temple is dated to the mid-7th Century. It was at one time thought to depict the myth of the origin of the river Ganges and its descent on earth flowing through the tangled hair of Shiva, but is now more widely thought to represent the story of the penance of Arjuna, one of the heroes of the Mahabharata, a penance undertaken to win the magic axe of the god Shiva..